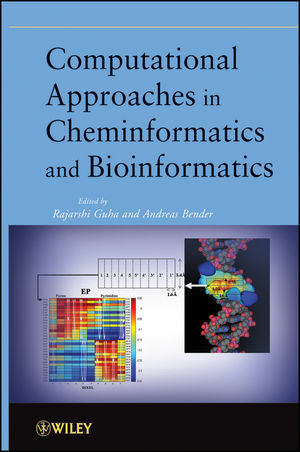 Bridging the gap between cheminformatics and bioinformatics for the first time, Computational Approaches in Cheminformatics and Bioinformatics provides insight on how to blend these two sciences for progressive research benefits. It describes the development and evolution of these fields, how chemical information may be used for biological relations and vice versa, the implications of these new connections, and foreseeable developments in the future. Using algorithms and domains as workflow tools, this revolutionary text drives bioinformaticians to consider chemical structure, and similarly, encourages cheminformaticians to consider large biological systems such as protein targets and networks. Also including insight from public (NIH), academic, and industrial sources (Novartis, Pfizer), this book offers expert knowledge to aid scientists through industry and academic study. The invaluable applications for drug discovery, cellular and molecular biology, enzymology, and metabolism make Computational Approaches in Cheminformatics and Bioinformatics the essential guidebook for evolving drug discovery research and alleviating the issue of chemical control and manipulation of various systems. RAJARSHI GUHA, PhD, is a Research Scientist at the NIH Center for Translational Therapeutics in Rockville, Maryland. His research covers a variety of topics in cheminformatics and chemical data mining, addressing software and methodology development as well as applications in areas such as high throughput screening and high content imaging of small molecules and siRNA's. Prior to working at the NIH, he was a visiting assistant professor in the School of Informatics and Computing, Indiana University. ANDREAS BENDER, PhD, is a Lecturer for Molecular Informatics with the Unilever Centre for Molecular Science Informatics at the University of Cambridge. His research encompasses ways to integrate—and analyze—chemical, biological, and phenotypic data, with the aim to design molecular structures with a desired property profile. Andreas Bender received his PhD from the University of Cambridge and worked for the Novartis Institutes for Biomedical Research in Cambridge, Massachusetts before returning to his current position in academia. Chapter 1. Bridging Chemical and Biological Data: Public Knowledge Spaces (Paul A. Thiessen, Wolf-D. Ihlenfeldt, Evan E. Bolton, and Stephen H. Bryant). Chapter 2. Bridging Chemical and Biological Information: Implications for Pharmaceutical Drug Discovery (Jeremy L. Jenkins, Josef Scheiber, Dmitri Mikkailov, Andreas Bender, Ansgar Schuffenhauer, Ben Cornett, Vivien Chan, Jason Kondracki, Bernhard Rohde, and John W. Davies). Chapter 3. Cheminformatics taking Biology into Account: Protochemometrics (Jarl ES Wikberg, Ola Spjuth, Martin Eklund and Maris Lapins). Chapter 4. Compound Activities in Times of Systems Biology (David E. Patterson). Chapter 5. Molecular Descriptors for Biological Systems (N. Sukumar, Sourav Das, Michael Krein, Rahul Godawat, Inna Vitol, Shekhar Garde, Kristin P. Bennett, and Curt M. Breneman). Chapter 6. Graphs: Flexible Representations of Molecular Structures and Biological Networks (Milind Misra, Shawn Martin, and Jean-Loup Faulon). Chapter 7. Workflows Tools for Managing Biological and Chemical Data (Thorsten Meinl, Bernd Wiswedel, and Michael R. Berthold). Chapter 8. Using Chemical Structure to Infer Biological Function (Angelo D. Favia and Irene Nobeli). Chapter 9. Using Chemical Structure as Probes for Biological Networks (Florian Nigsch).